This was the first bread I learned to make after getting baptized into The Church of Jesus Christ of Latter-day Saints at age nineteen and was all gung ho about being domesticated. I used to make it for the missionaries who taught me the discussions. 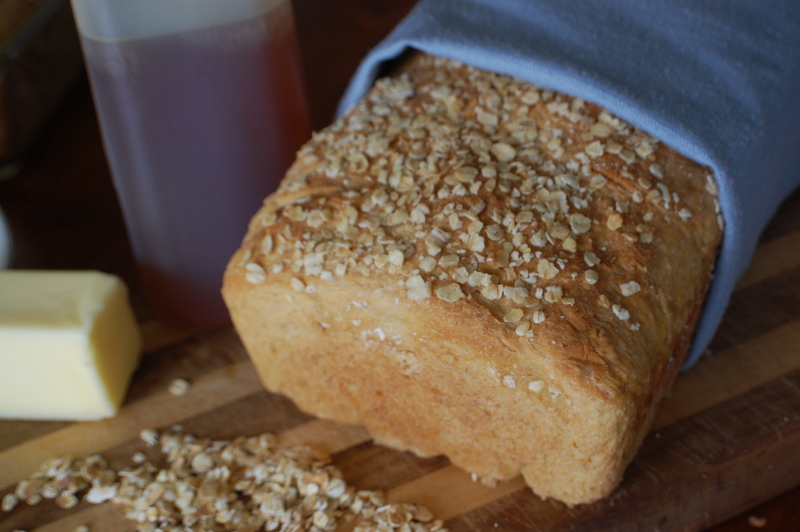 This is a sweet, moist yeast bread that makes wonderful toast. Instead of soaking oats in water, you can use two to four cups of leftover cooked oatmeal. I’ve done both methods with excellent results. In a large mixing bowl, combine boiling water and oats; let stand until warm. In a small bowl, dissolve yeast in warm water; add to oat mixture. Add honey, oil, salt, and four cups flour; beat until smooth. Add enough remaining flour to form a soft dough. Turn out on a floured board or surface; knead until smooth and elastic, about 6 – 8 minutes. Place in a greased bowl, turning once to grease top. Cover and let rise in a warm place until doubled, about one hour. Punch the dough down. Shape into loaves and place in two greased loaf pans. Brush tops with melted butter and sprinkle with oats. Cover and let rise in warm place until doubled, about thirty minutes. Bakes at 350 degrees for 50 – 55 minutes or until golden brown. I doubt I could make it, but it sounds good. Well, Alex, I bet you could. 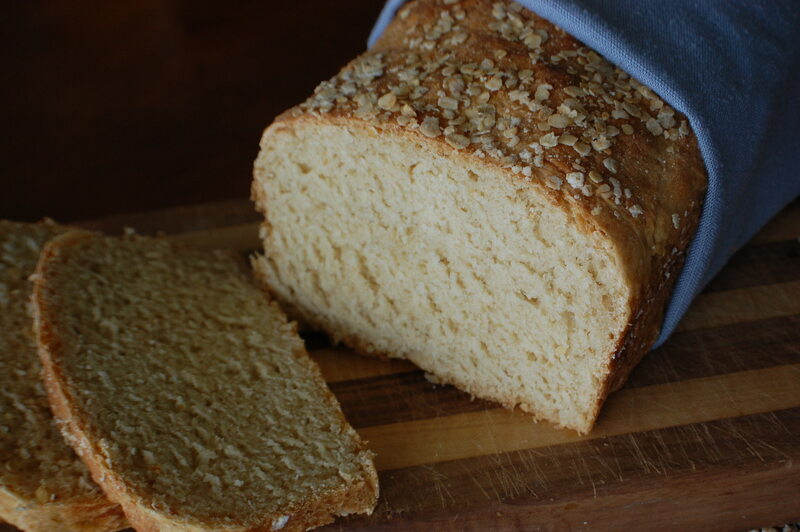 I was a 19 year old college girl who had only made cookies and Rice Krispie treats when I learned to make this bread. I’m not saying it’s easy but if you want the best toast you’ve ever eaten, it is worth the trouble! Mirka, The bread is rising? You are trying it already? Please let me know how it turned out! Connie, When you do, let me know what you think of it! Did you ever make the pancakes? Several months ago, I began using white whole wheat flour in many of my recipes. I substitute it cup for cup for the all purpose. I’ve used it in yeast bread, hot rolls, moist cakes like applesauce, cookies (choc chip, snickerdoodles, oatmeal), and cornbread. In every instance, as long as I don’t ‘scoop’ the flour but lightly spoon or dust it into the measuring cup, the products came out wonderful. I just add a little extra yeast or leavening. Since it has the same nutrition as regular whole wheat, ‘white’ WW keeps the food value but is less dense and lighter in color. And the men folk don’t know what hit ’em, LOL. A friend told me the same thing. She said if I use flour ground from white wheat I’ll get different results than flour from red wheat. Good to know! I also wanted to add that I used to make this recipe with half whole wheat flour/half white flour. Mixing the whole wheat and white gives it more fiber and density but it’s still light enough to rise well. Whenever I tried it with 100% whole wheat, it was too dense. Bet it would work with the flour ground from white wheat however. Oh great, now I’m homesick, thanks, Donna 🙂 I sure do miss those big ol’ thunderstorms! Hope you love the bread!